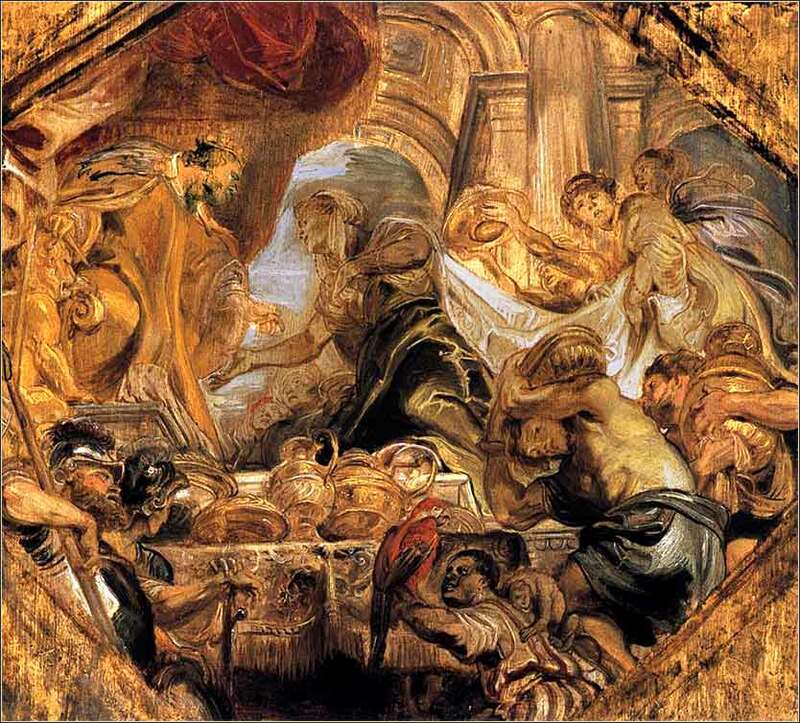 Solomon Receives the Queen of Sheba by Peter Paul Rubens, ca. 1620. 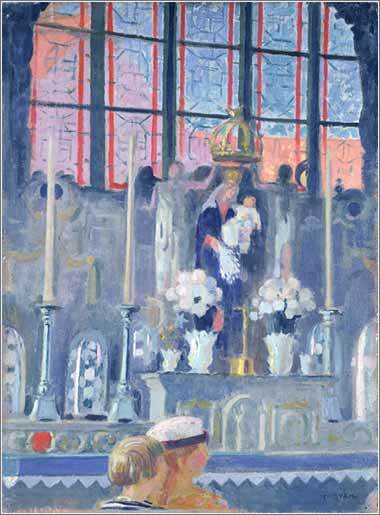 Church of La Clarte by Maurice Denis, ca. 1917. Solomon's provision for one day was thirty cors of fine flour and sixty cors of meal, ten fat oxen, and twenty pasture-fed cattle, a hundred sheep, besides deer, gazelles, roebucks, and fattened fowl. For he had dominion over all the kings west of the Euphrates. And he had peace on all sides around him. And Judah and Israel lived in safety, from Dan even to Beersheba, every man under his vine and under his fig tree, all the days of Solomon. Solomon also had 40,000 stalls of horses for his chariots, and 12,000 horsemen. And those officers supplied provisions for King Solomon, and for all who came to King Solomon's table, each one in his month. They let nothing be lacking. What happens when a wise man becomes the leader of a nation? That is easy enough to see; even a cursory examination of world history shows the correspondence of wise rule with political gain. But what is wisdom, and how can we discern it? For we, who elect our leaders, have been fooled as often as not. Wisdom does not seem to carry very much weight with the electorate; truthfully, a wise leader is a lucky accident. Solomon's proverb, “the fool shall be servant to the wise of heart”, is more in the nature of advice than inevitability. Solomon himself gives us one way to discern the wise from the foolish: “The fear of the Lord”, he writes repeatedly, “is the beginning of wisdom.” (e.g. Proverbs 9:10) Surely Solomon is history's great object lesson. Israel's shining moment of power and prestige came only when the anarchic period of the Judges ended and God's anointed King, David the shepherd, a man who (at least in his early days) walked before God in reverence and obedience, came to power. Fear of the Lord begat wisdom, and wisdom begat 40,000 horse stalls and a fig tree in every garden. Here, for once, a ruler of great wisdom sitting on the throne reflects not chance, but divine purpose. The people's choice, Adonijah, was overruled solely by the will of David. It was God, acting through his servant David, who thrust Solomon into office. It is fun to consider how rich, powerful, and wise Solomon became; and how a rather poor little nation like Israel came to a position of such prominence. But we must remember, God is telling us a story, with Canaan as His stage and the Jews as His troupe, and we are only to the end of Act II. Glorification of worldly success is not, ultimately, the point at all; for much later in the story, the One who brings true salvation will inform us that we cannot serve both God and Mammon (or “money”).